Fans who have been closely following Suicide Squad will know that Margot Robbie decided to commemorate the experience of filming by opening her own Harley Quinn Tattoo Parlour. 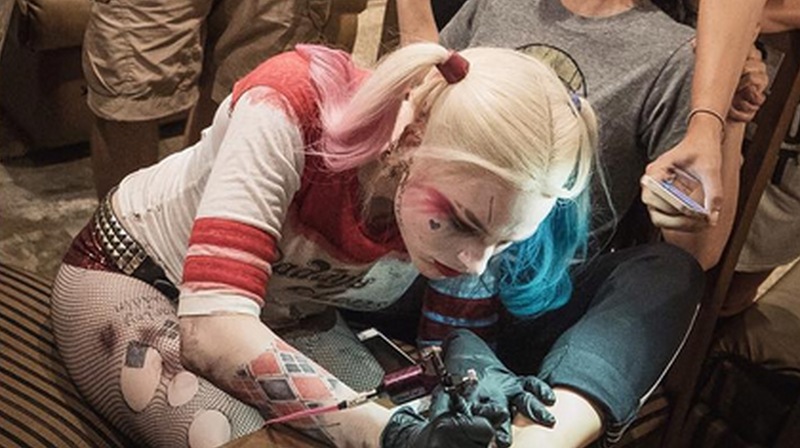 Robbie gave ‘Skwad’ tattoos to several of her co-stars – but not Will Smith – but it turns out it took her more than one go to get the hang of it. She was a guest star on Stephen Colbert’s post-Super Bowl Late Show along with Tina Fey and revealed that Jai Courtney’s (Boomerang in the film) assistant was the first to volunteer. Robbie also shed some light on her notoriously adventurous personality, explaining that she’s been skydiving and diving with sharks a couple of times. You know, just for fun. She’s given out 26 tattoos and got 25 of them right. It’ll also be difficult for Courtney’s assistant, Simon, to hide the misspelled tattoo – because it’s on his arm.